Fitness Pollenator: Is There A Science to Physical Therapy? Is There A Science to Physical Therapy? Many disciplines rely on a grand theory, or an overarching conceptual framework -- something that ties all the pieces together. According to Carter and Lubinsky,1 a grand theory provides a “broad conceptualization of phenomena.” In other words, a grand theory purports to address big ideas -- or even an entire discipline -- with one theoretical context. It attempts to subsume the middle-range theories within a discipline, which typically apply more to direct action or clinical practice. For example, physics has a number of competing grand theories: The Grand Unified Theory, The Theory of Everything, and String Theory. (They say competition is good for business.) When it comes to healthcare professions, occupational therapy and nursing have both given considerable thought to theory over the last several decades.1–3 What about physical therapy? Does it have a grand theory? To avoid impending professional doom, Hislop proposed the grand theory of pathokinesiology. 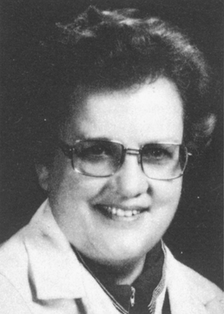 She defined pathokinesiology as the application of anatomy and physiology to abnormal human movement. 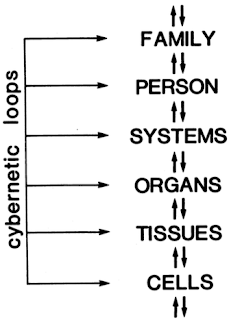 Within the pathokinesiology framework, Hislop described an interweaving hierarchy of the human organism ranging from cells to tissues, organs, systems, person, and lastly, family. The primary goal of physical therapy, Hislop asserted, was to restore movement homeostasis at the tissue, organ, system, and person levels. This restoration would be accomplished primarily through therapeutic exercise. 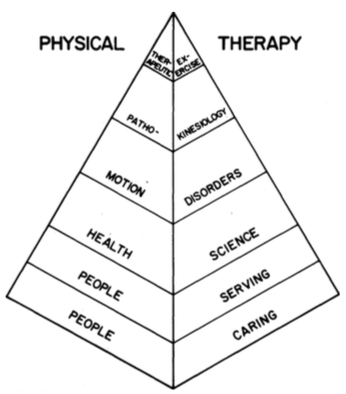 Pathokinesiology was the “distinguishing clinical science of physical therapy,” Hislop proclaimed. She urged her fellow physical therapists to adopt the pathokinesiology framework for the diagnosis, treatment, and prevention of movement disorders. To make this ideology more concrete, consider a patient who presents with a hamstring strain. This perturbation would have occurred at the tissue level of the pathokinesiology hierarchy. Disruptions at higher levels would likely accompany the strain. There might be stress at the organ level, weakness and decreased range of motion at the system level, and reduced mobility at the person level. Therapeutically, the physical therapist could intervene with manual therapy (on the tissues), passive stretching (to the muscle-tendon system), and strengthening exercises (for the person). In this context, pathokinesiology appears to be an attractive model. Rather than fixating on particular treatment techniques, pathokinesiology contextualizes patient care in terms of the aforementioned unified goal: movement homeostasis. Whichever therapies best accomplish the goal for the individual patient are the ones that should be used. Thus, rather than marry themselves to specific techniques, physical therapists must become devoted to scientific principles. Techniques are constantly changing, but principles endure. As consumers of the scientific literature, pathokinesiology-based practitioners can seamlessly integrate or abandon modalities as research discovers or debunks them. The theory of pathokinesiology has several shortcomings. One of the primary arguments against it is the preexistence of other well-established sciences like anatomy, physiology, biomechanics, and pathology. It’s unclear where pathokinesiology as a science can fit in given existing research paradigms and terminology in these fields.7,9 Regarding this point, to this day there is still no “Journal of Pathokinesiology.” In addition, most present-day clinicians continue to use verbiage like “pathoanatomy” and “pathophysiology” instead. Nor is Hislop’s definition of pathokinesiology entirely applicable to the many and diverse branches of physical therapy. For instance, one cardiopulmonary physical therapist noted a major disconnect in the literature of her specialty to normal and abnormal movement.7 This connection was Hislop’s most fundamental proposition. Another major flaw of pathokinesiology is the placement of therapeutic exercise at its pinnacle. The practice of physical therapy -- and all its various specialties -- involves much more than therapeutic exercise.12 In addition to the biomechanical factors associated with rehabilitation, there are also psychological and social ones that can be equally important. Hislop did well to acknowledge the importance of treating patients’ psychology in her address. However, by excluding movement interventions beyond the person level, she relegated the social component to outside of the physical therapist’s scope. Moreover, by solely dealing with therapeutic exercise, she diminished the physical therapist’s role in injury prevention. Perhaps the best evidence of all that pathokinesiology never came to be regarded as physical therapy’s grand theory came in 1995. A group of Canadian physical therapists issued sentiments that eerily echoed those of Hislop twenty years prior.13 They declared once again that physical therapy was facing an identity crisis. To avoid impending professional doom, they introduced the Movement Continuum Theory. 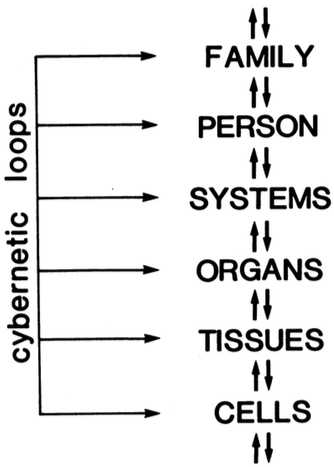 Not by coincidence, the Movement Continuum Theory held many of the same basic tenets as pathokinesiology. Chiefly, the authors defended the already familiar notions from pathokinesiology that (1) “movement is essential to life,” (2) “movement occurs on a continuum from the microscopic level to the level of the individual in society,” (3) “movement levels on the continuum are influenced by physical, psychological, social and environmental factors,” and (4) “movement levels on the continuum are interdependent.”13 Within this framework, the authors expanded on Hislop’s hierarchy of the human organism. They included additional levels in the hierarchy and accounted for both intrinsic and extrinsic factors to the person. Most importantly, they stressed that physical therapists can act on any and all levels of the continuum to improve movement capacity. 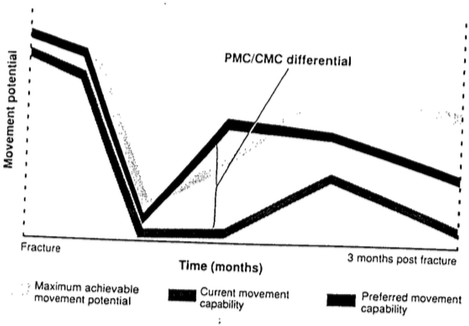 Another key addition to this model was the distinction between a patient’s “current movement capacity,” “preferred movement capacity,” and “maximum achievable movement potential.”13 To illustrate these principles, recall the earlier example of the patient with the hamstring strain injury. Suppose that patient is a collegiate field hockey player. Based on a variety of parameters like age, genetics, and anthropometry, she has a certain maximum achievable movement potential. This is her theoretical ceiling for movement capacity. She also has a preferred movement capacity, or desired level of movement. Given her primary activity (field hockey), that preferred capacity may be fairly close to her maximum achievable. At the time of the injury, this athlete would have been operating at some current movement capacity, likely situated below both her preferred and maximum capacities. When the patient presents in the clinic a few weeks post-injury, her preferred movement capacity is unchanged, but her current movement capacity has dropped significantly below pre-injury level. Thus, there now exists a differential between her current and preferred movement capacities. The developers of the Movement Continuum Theory identified the reduction of this differential as the physical therapist’s primary purpose.13 To borrow Hislop’s words, this was the physical therapist’s identity. By closing another gap -- that between the current and maximum achievable movement potential -- the physical therapist’s role in injury prevention also meshes with the Movement Continuum framework. While treating the injury, the therapist can address areas of movement dysfunction unrelated to the injury and its sequelae, too. In contrast to pathokinesiology, Dr. Shirley Sahrmann refers to this treatment model as kinesiopathology in her perspective paper The Human Movement System: Our Professional Identity.14 In addition to treating movement dysfunction resulting from pathology (i.e. pathokinesiology), physical therapists must work to prevent movement dysfunction from resulting in future pathology (i.e. kinesiopathology). In the example of the field hockey player, that might mean bilateral strengthening of the glutei to alleviate the burden on the hamstrings in hip extension. At first pass, the idea of a grand theory of physical therapy may seem to be just a matter of semantics. It certainly did to me. As long as patient outcomes are positive, who cares what the science is called? Upon further investigation, however, it becomes clear that a grand theory is directly linked with those same patient outcomes. Identifying the scientific framework of physical therapy provides the discipline with a body of knowledge they can take ownership of. It unifies the various specialty disciplines as one. It intimately links clinicians with researchers and lends to treatment methods being subjected to increased scientific scrutiny. All of these factors no doubt result in better and more precise patient care. Above all, a grand theory ensures the long-term survival of the physical therapy profession. There’s no denying that pathokinesiology had a number of imperfections which prevented its widespread adoption. Nevertheless, it did lay the groundwork for future models, which may in time prove more complete. More than anything, Hislop’s mission was to promote a dialogue regarding the essence of physical therapy and its relationship with science. As evidenced by pathokinesiology’s successors, the Movement Continuum Theory and Sahrmann’s Human Movement System, this discourse has resurfaced again and again. Although pathokinesiology was never accepted as the grand theory of physical therapy, in this sense Hislop’s Not-So-Impossible Dream may just have been realized after all. 1. Carter R, Lubinsky J. Rehabilitation Research: Principles and Applications. Vol 5th ed. St. Louis, Missouri: Elsevier; 2016. 2. Law M, Cooper BA, Strong S, Stewart D, Rigby P, Letts L. The Person-Environment-Occupation Model: a transactive approach to occupational performance. Can J Occup Ther. 1996;63(1):9-23. doi:10.1177/000841749606300103. 3. Watson J. Nursing: Human Science and Human Care: A Theory of Nursing. New York: National League for Nursing; 1988. 4. Hislop HJ. The not-so-impossible dream. Phys Ther. 1975;55(10):1069-1080. www.ncbi.nlm.nih.gov/pubmed/1161801. 5. Rothstein J. Pathokinesiology–a name for our times? Phys Ther. 1986;66(3):364-365. ptjournal.apta.org/content/66/3/364. 6. Schlegel R. Is pathokinesiology synonymous with physical therapy? Phys Ther. 1986;66(3):366-367. http://ptjournal.apta.org/content/66/3/366. 7. Zadai C. Pathokinesiology–the clinical implications from a cardiopulmonary perspective. Phys Ther. 1986;66(3):368-371. ptjournal.apta.org/content/66/3/368. 8. Purtilo R. Definitional issues in pathokinesiology–a retrospective and look ahead. Phys Ther. 1986;66(3):372-374. ptjournal.apta.org/content/66/3/372. 9. Smidt G. Walking the trail of physical therapy research. Phys Ther. 1986;66(3):375-378. ptjournal.apta.org/content/66/3/375. 10. Rose S. Description and classification–the cornerstones of pathokinesiological research. Phys Ther. 1986;66(3):379-381. ptjournal.apta.org/content/66/3/379. 11. Walker JM. Research in pathokinesiology–what, why, and how. Phys Ther. 1986;66(3):382-386. ptjournal.apta.org/content/66/3/382. 12. O’Hearn MA. The elemental identity of physical therapy. J Phys Ther Educ. 2002;16(3):4-7. https://www.questia.com/library/journal/1P3-424678001/the-elemental-identity-of-physical-therapy. 13. Cott C, Finch E, Gasner D, Yoshida K, Thomas S, Verrier M. The Movement Continuum Theory of physical therapy. Physiother Canada. 1995;47(2):87-95. 14. Sahrmann SA. The Human Movement System: Our Professional Identity. Phys Ther. 2014;94(7):1034-1042. doi:10.2522/ptj.20130319.